Knowing you are getting the best motorcycle insurance policy is a great feeling. But how do you really know if your policy is the best? The only way to figure it out is to compare motorcycle insurance quotes to determine what options are available. You’ll likely need to think about purchasing motorcycle insurance—in fact, in most states, you may be required to do so. But before you do, it pays to be prepared. What sort of insurance do you really need? What determines how much you will pay? And how do you go about getting the best bang for your buck? Just like with car insurance, the price you’ll pay in premiums on motorcycle insurance is based upon a variety of factors—some out of your control and some easily regulated. If you are currently insuring another vehicle, you’ll probably know how risky you are based on how your premiums compare to the average driver in your state. And just as with car insurance, motorcycle insurance premiums will be much higher if you’re insuring a Ducati than if you’re insuring a moped. It will also be cheaper if you drive your motorcycle once in awhile cruising on rural roads than if you drive it every day on the highway come rain or shine. After you determine the personal factors—both those you can change and those that you cannot, it’s time to shop around. Make sure to compare quotes from several different companies and ask about discounts for safe driving, a stellar record, or bundling your insurance. Make sure coverage quoted is identical or as close to it as possible on each quote. A lot of factors go into determining the average cost of motorcycle insurance. If you are 25-60, driving your bike only occasionally, looking to buy only liability coverage, and have a good driving record, you may be receiving offers in the ballpark of $200-$500 per year. 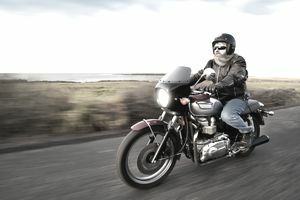 If you are younger, driving a speedy hot motorcycle, have a bad driving record, or are looking for more comprehensive coverage, you may be paying more in the neighborhood of several thousand dollars per year. Are you a relatively safe driver who is married, middle-aged, and lives in a state without a lot of traffic? Your insurance premiums are going to likely be lower than your older friend who lives in New York City, is single, and has been in several accidents. There are many factors both in and out of your control that will affect the rates you can expect to pay when you are shopping for motorcycle insurance, and it’s important to be aware of these things. If you’re already insured for another vehicle, your insurance agent can help you identify the things that make you a riskier asset, as well as the things that work to your advantage. In the vast majority of states, you will be required to purchase motorcycle insurance liability coverage. Even if you are not required, though, you should definitely still purchase insurance—if you accidentally hit someone and they are injured or killed, you could be on the hook for millions of dollars of damages and/or medical bills. Each state has different requirements, but you will likely need to have a certain amount of both bodily injury liability coverage and property damage liability coverage. If you choose not to purchase motorcycle insurance in a state that requires it, you are going to have a really hard time driving it on the road. You will need proof of insurance in order to register your bike at the DMV, which you need to do in order to get a license plate. If you’re caught driving without a license plate, you will very likely be caught and ticketed by a police officer. Collision coverage covers both the driver of the motorcycle and the motorcycle itself during an accident. A subset of collision coverage is liability coverage, which covers any damage you cause during an accident, whether it be to someone else’s property or person. If you only bring your bike out once in awhile, liability coverage may be your best bet. It’s also generally the minimum required by law in most states. Uninsured/underinsured motorist liability coverage is often also mandated by law since there are thousands of vehicles and motorcycles on the road with no insurance. If those drivers hit you and do not have insurance, your only option for having your expenses covered would be to sue them—unless you have this type of coverage. Passenger personal injury protection coverage is also important if you plan on having other riders join you on your bike; it’ll cover their medical expenses in the event of an accident. Comprehensive coverage covers your vehicle—well, more comprehensively. If a tree falls on your bike, it catches on fire, or it’s stolen by a thief, you will likely be covered. If you ride your bike often or park it in a place where it’s likely to get stolen or damaged, comprehensive coverage is probably your best bet. Custom and vintage coverage are important if you have a custom or vintage bike. Some insurers will be reluctant to cover these types of bikes because their value is hard to place. Accessory coverage is important if you are often tinkering with your bike and need a policy that covers customizations, not just the original parts of your vehicle. Rental reimbursement, towing and transport, and roadside assistance coverage are also important things to consider, whether as a part of your motorcycle insurance policy or through an automotive membership club. Insurance companies make money by recruiting new clients and keeping them—and you can and should use this to your advantage. If you’re shopping around (and you should be! ), you already know to ask about discount options. But you should also ask about their lay-up policy. Some companies, in an effort to attract and retain new drivers, will offer steep discounts if you pay 6 months to a year in advance.